Octavia Butler died last weekend, possibly of a stroke -- though the immediate cause of death was a head wound caused by a bad fall. In these rhetorical questions is a statement of her broad-minded mission. 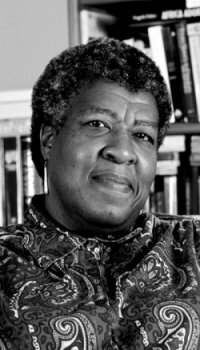 Octavia Butler was as ecumenical and progressive as they come, as far as the politics one finds embedded in her works. But she never used her writing to make narrow kinds of political arguments -- at least, not in the sense of the obvious rhetoric of race, gender, and sexuality that dominates our cultural debates. She either approached it eccentrically (time travel, blood lineage, and slavery in Kindred), or looked ahead a thousand years, to consider parasite/host (alien/human) eroticism. Her writing challenged and provoked all kinds of people, including those who weren't concerned about all the barriers she broke as a black woman sci-fi writer in a field dominated by heterosexual white men. Incidentally, Octavia Butler is one of the rare sci-fi/speculative ficiton writers whose work really captivates readers who are themselves scientists. Here, for instance, is a biologist's response to the Xenogenesis trilogy. Very sad. We've lost another great one. Most likely she passed from an epidural or subdural hemorrhage secondary to head trauma.